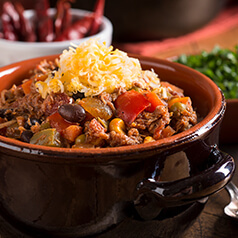 Not ready to give up your winter chili recipes now that spring is here? This veggie chili is a hit every time I serve it. Not only is it delicious, it is filled with 18 grams of fiber and is very high in potassium. This is a great dish to double and take to a potluck because you can easily keep it warm in a crockpot (just leave out the cheese). Heat oil in a large pot on medium high and add onion and garlic. Cook until soft (about 5 minutes). Add broth, wheat berries, barley, and garam masala and bring to a boil. Reduce heat and simmer for 30 minutes, covered. Stir occasionally. Add eggplant, chopped tomatoes, lime juice, drained kidney and navy beans to pot. Season with salt and pepper to taste and stir and simmer for about 10 more minutes. To serve: place two of cubes of mozzarella in the bottom of a bowl, and top with 1/6th portion of chili. Garnish with avocado and green onion if desired.